These hand-crafted Ray of Light Wand Pendants are quite exceptional. 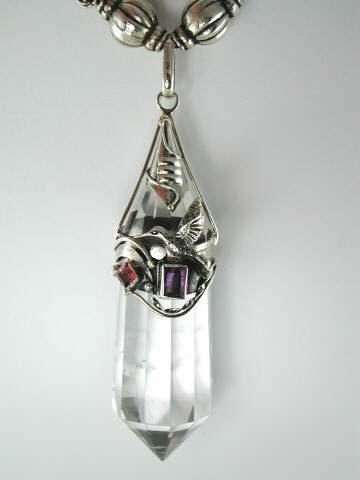 Designed in the style of the famous Vogel Healing Wands, created by Dr Marcel Vogel, these stunningly beautiful, faceted wand pendants are handcrafted in quartz - Clear, Rose or Amethyst - and adorned in sterling silver set with semi-precious gemstones. This one features a large, emerald-cut Amethyst with a small emerald-cut Pink Tourmaline and is accented with a sterling silver humming bird. Powerful healing tools, they exude a perfect Yin Yang balance of energy and promote harmony, healing and enlightenment and their strength is equalled only by their beauty. The larger end of the wand is the female, receptive end. It draws in energy (life force energy or Prana), which spirals through the length of the crystal, being amplified every time it hits a facet. The other end of the crystal wand, which has a sharper, more elongated point, is the male end - the focusing point. It has been discovered that by cutting quartz in this shape, to certain exact dimensions consistent with Sacred Geometry, it produces an instrument that has the same vibration as structured water - with a high frequency signature of 454 - the same frequency of holy or sacred water. The pendants can also be used as pendulums - for dowsing for and clearing energy blockages in people, animals and in the environment. It comes on a waxed cotton necklace threaded with four silver beads which measures approximately 25cm from top to bottom.